It’s time for another tour with The Classics Circuit! 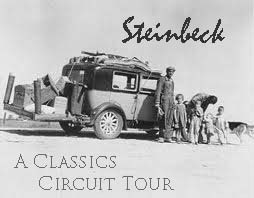 Sign up is open for a late August blogosphere tour celebrating Steinbeck. I had the opportunity to pull together the introductory page about John Steinbeck’s writings. One of my favorite books is East of Eden, which I’ve read twice. I have also read Of Mice and Men, but beyond that, I haven’t read anything else by Steinbeck! Here are some of the books that I really want to read. The Pastures of Heaven (1932). Short stories. Always a good place to start. The Long Valley (1938). A collection of twelve short stories, including “The Red Pony.” Again, stories seem like a good place to start. Cannery Row (1945). A series of vignettes about a few people living in Monterey, California. I like vignettes. Sweet Thursday (1954). A sequel to Cannery Row that takes place after World War II. I hope to like Cannery Row, so would then of course like this one. Tortilla Flat (1935). A novel set in Monterey, California, portraying with great sympathy and humour a group of paisanos – literally, countrymen – a small band of errant friends enjoying life and wine in the days after the end of the Great War. I loved East of Eden’s setting in California. Maybe this one would likewise capture the setting beautifully. The Grapes of Wrath (1939). A Pulitzer Prizing winning novel about a family of poor sharecroppers driven from their home during the Great Depression. Can you believe I haven’t read this yet? This is the one I’ll read for the tour. The Wayward Bus (1947). A novel written as internal monologues for characters in Salinas Valley, California in the years after WWII. I’m curious to see how Steinbeck captures the interior monologues. He has such a way with words. Travels with Charley: In Search of America (1962). A travelogue with his poodle, Charley. Sounds interesting. Burning Bright (1950). An experimental morality play written in the form of a novella. I’m intrigued. The Short Reign of Pippin IV: A Fabrication (1957). A political satire that pokes fun of France. This sounds quite funny. The Acts of King Arthur and His Noble Knights (1976). A retelling of the Arthur legend, based on L’Morte D’Arthur by Sir Thomas Mallory. I’d love to read this when I’m trying to get through the original Mallory version. Or maybe I’ll just try Steinbeck’s retelling (I hear Mallory is quite a challenge…). If you are unfamiliar with The Classics Circuit, here’s how it works. You read a book. We assign you a day during the tour. 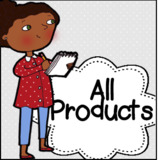 On that day, you post about the book on your blog (you must have a blog to participate). Whether or not you have time to read a book and be a participant on the tour, you can always follow the schedule of stops and see what others have to say. I’ve been recommended to start with Tortilla Flat and I would love to participate in the tour, but I need to check if I can get a copy of this book on time. I’ll let you know ASAP. Iris » I hope you’ll be able to join in! I have read Steinbeck’s “Grapes of Wrath” and through it i one of the greatest author I’ve read. Steinbeck depicted the life of the poor family with a passion and feel that would engross people into the flow of the story. His books are some of my favorites, goodluck to those who will participate in the tour! Jeff Rivera » That’s the one I’m going to read! I’m glad to hear you liked it so much. East of Eden is one of my favorite books too! I haven’t read it in well over ten years, but I remember picking it up as a teen one summer and just being completely engrossed by it. I think I read it in something crazy like three days! Other than that, I’ve only read two other Steinbecks: Of Mice and Men (which I love fiercely), and Tortilla Flats, which I read and reviewed on my blog last year and thought was ok, but not great. I think it does capture a certain piece of California quite well, but to me the storytelling was a bit juvenile and to be honest I don’t remember much about the novella anymore. Probably the next Steinbeck I’ll read is the Grapes of Wrath, because it seems really wrong that I haven’t already read it! Steph » that’s exactly how I feel about GRAPES OF WRATH. How have I not read it yet? I have yet to read a Steinbeck book I have not loved – Grapes of Wrath is probably my favorite. I also really enjoyed Travels with Charley. I don’t think you can go wrong with any of his books! Wendy » I look forward to reading more of them! I’ve read Cannery Row, Sweet Thursday, Tortilla Flat, Travels with Charley, The Moon is Down, The Wayward Bus, Burning Bright, Winter of Our Discontent, To A God Unknown, and Of Mice and Men. I haven’t read East of Eden or The Grapes of Wrath…yet. I hope to get to one of them for this tour, and the other…at some point! I would recommend Cannery Row or Tortilla Flat. Then again Travels with Charley was fun too! Becky » I love EAST OF EDEN! It’s such a sweeping epic of a book! Cannery Row was a highlight for me earlier this year and I adored Of Mice and Men; I’ll possibly read Sweet Thursday or Tortilla Flat next before tackling the tomes. Claire (Paperback Reader) » I personally loved EAST OF EDEN. I have to give Cannery Row a try. Glad you like it so much! Grapes of Wrath is absolutely amazing; it’s true, everyone should read it, at least all Americans who want to be well-read. However, I also loved Cannery Row, which is a much lighter read (there is one vignette about frogs which is HILARIOUS), also, I loved Travels with Charley — it was my very first Steinbeck so it has a special place in my heart. Before TWC I had absolute and utter Fear of Steinbeck, but one of my online book groups chose it so I took the plunge. I read half of it in the bookstore and loved it, so I was brave enough to try Grapes of Wrath, which I also loved. It’s long and serious, but it just flew by. I have to admit I still haven’t read East of Eden even though I’m sure I’ll love it! I’ll probably read something shorter for the Classics Circuit. I bought a copy of A Russian Journal several years ago so I want to read that one, and I recently found a 1950s copy of Pippin IV at the library sale for $1 which I couldn’t pass up, so that’s on the short list as well. I think I’m going to read Steinbecks for the Circuit!